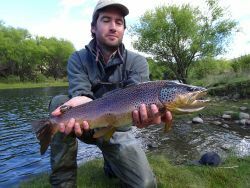 Coyhaique, Patagonia Aysen Chile, Chile Nice trouts fished close to Coyhaique; sunny day but windy, 5 bites in 3 hours; 30 to 35 inches. Patagonia Aysen Chile, Chile The big brown of Patagonia; in april, the huge brown of the Gal Carrera lake are leaving the lake and go upstream to breed. It's time to go fishing! Traful River Valley, Patagonia, Argentina This is a closeup pic of a landlocked Atlantic salmon caught by Kathy Beck on the Traful in March of 2010 at dusk. Piedra del Aguila, Patagonia, Argentina Here's Tom Young (Hovey pty. 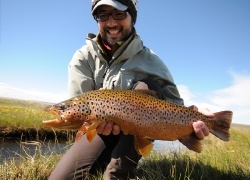 ), with a grand 28" classic Limay River Lodge brown trout. This was last March. Piedra del Aguila, Patagonia, Argentina Fresh from TODAY !!!!! 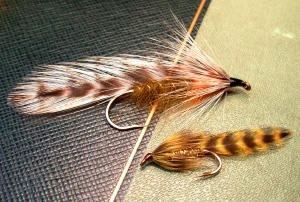 Great surface fishing with attractors on the Limay, out of LIMAY RIVER LODGE !! Piedra del Aguila, Patagonia, Argentina Bill Wason with guide Pablo and one of the many fish he caught on the Limay. Great surface action during the entire month of December. 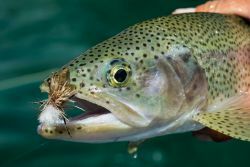 Piedra del Aguila, Patagonia, Argentina Fishidries and nymphs on the surface for turbo-charged rainbows like this one is one of the great attractions of the Limay Ri ver at LRL. This is from last season. 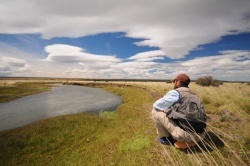 North Patagonia, the perfect fly fishing destination.